NEED A COOL GIFT FOR A DRUMMER OR MUSICIAN FRIEND? NOW AVAILABLE! DRUM CHART BUILDER SUBSCRIPTION CARDS. Now you can buy a gift of a new music program and give it to a friend that loves new technology. then take your iPad or tablet to your gigs or practice. No more printing so you will save money on printer ink. Just build a chart, grab your mobile device and go! A simple and fast setlist maker and metronome are included in the program to make performances go smoothly. Need a program to create your own drum charts that look clean and clear? 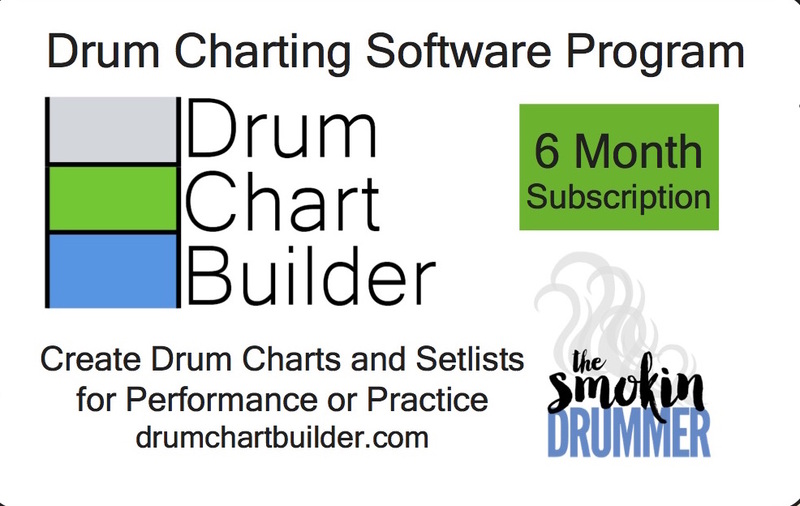 Purchase a 6-month subscription card for Drum Chart Builder. A drum charting software program for creating one-page drum charts just like the ones in this library. This program is browser based so you can use any mobile device for editing and viewing. 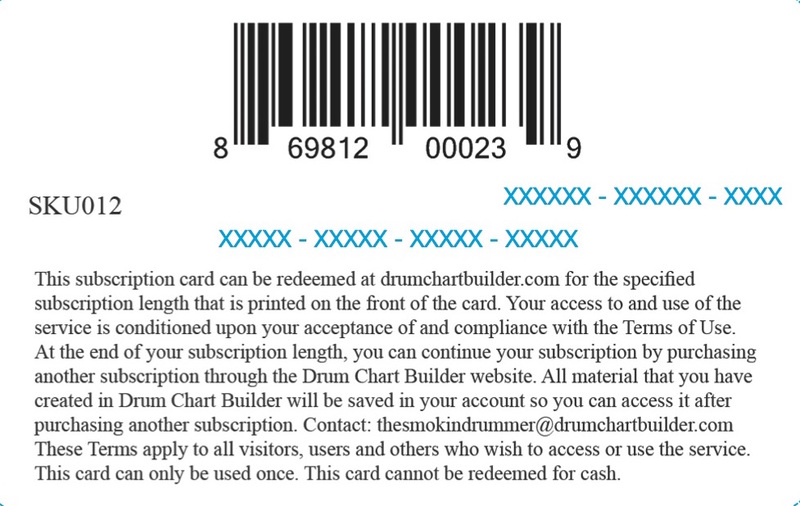 Simply redeem the code on the back of the card after opening an account at drumchartbuilder.com. These cards are a great gift for friends, family, and other musicians. Create your own drum charts and setlists with this amazing program on your computer and take your iPad or tablet to your gigs or practice. No more printing so you will save money on printer ink. Just build a chart, grab your mobile device and go! Setlist maker included so you can build your sets before you go and edit them at your performance. Blank chart screen to build a one page drum chart. Using the fast dropdown menus, choose song form, count out measures and add notation. Fast preset drum pattern library to add song patterns to your chart. Setlist maker is included with the program for creating a set and viewing all charts one by one. A metronome is available at the top of each chart so you can practice or perform with accuracy. At the end of your subscription length, you can continue your subscription by purchasing another subscription through the Drum Chart Builder website. All material that you have created in Drum Chart Builder will be saved in your account so you can access it after purchasing another subscription. This card can only be used once. This card cannot be redeemed for cash.